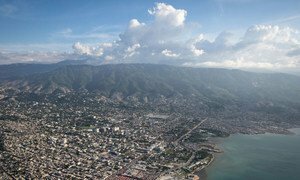 An aerial view of Haiti's capital Port-au-Prince. Is Haiti better prepared for disasters, nine years on from the 2010 earthquake? Half a capital city destroyed, 220,000 reported dead and 1 million residents displaced. This was the toll of the 2010 Haiti earthquake, which struck on 12 January, nine years ago.